The family of a 20-year-old man fatally stabbed in Nottingham have paid tribute to the "wonderful young man". 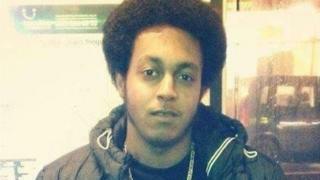 Esrom Ghide was found in Hawksley Road, Hyson Green, on Wednesday with stab wounds and died in hospital. In a joint tribute, Mr Ghide's family said he "was loved, is missed, and will always be cherished". Five boys - three aged 14, one aged 16, and one aged 17 - have been arrested on suspicion of murder. Detectives have been given extra time to question them. Mr Ghide's family said he was known as Hanny to them and his close friends, adding: "His passing has left a big hole in our lives." Det Insp Justine Wilson said: "This is a fast-moving investigation with five youths already in custody but we would still like to hear from anyone who has information that could help."